Continued stitching and beading the Fabric Necklaces. 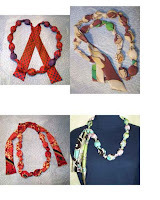 When I went to photograph them, started trying the necklaces in different positions and found they are quite versatile ... can be wrapped in a variety of ways to create different looks. I'm liking these more and more. I've finished through 7, although the photos on the 7th necklace didn't turn out ... lighting changed with nightfall (of course). I'm going to post 4 - 6 in my Artfire Shop. I'm thinking about giving the 7th away. Tomorrow I'm going to dirty the 1st example necklace I made and then handwash it in the sink and see how long it takes to dry ... I think styrofoam should be pretty instant, but want to make sure. Since these are fabric, I'd like to be able to pass them along with washing directions ... accessories should be cleanable, in my opinion.